Thailand is a constitutional monarchy of Southeast Asia. Founded in 1782, the Chakri dynasty took over from the Ayutthaya kings defeated by the Burmese. It was during this dynastic change that Bangkok became the capital of the kingdom. The Chakri kings took the dynastic name of "Rama". Nine kings have succeeded each other since 1782. In 1932, the absolute monarchy became a constitutional monarchy on the British model. King Rama IX, ninth of the Chakri dynasty, has ruled the country since 1946. At the time of the Ayutthaya Kingdom, the flag, which served as a rallying point on the battlefield, was solid red. Red was not only the color of the high dignitary of the Kingdom but also a color that is visible from a distance at a glance. Under Rama I, to distinguish the Thai flag from the Malay flag, which was also red, a white chakra was added. King Rama II, owner of 3 white elephants had this sacred animal placed inside the chakra. Between 1851 and 1868, Rama IV decided to separate the elephant from the chakra. 2 flags then floated on the Kingdom of Siam: the white chakra on a red background for all that concerned the King and the white elephant for other occasions. In 1916, Rama VI placed the elephant on a base and harnessed it. In September of the same year, he went to the north of the country, which had been ravaged by floods. He saw that in the chaos, flags had been hoisted upside down, the sacred elephant with paws in the air. To prevent this sacrilege from happening again, he decided to opt for a flag that would always be in the right direction and thus appeared, in 1917 for the first time, 3 horizontal red stripes on a white background. After the first world war, the current flag was adopted. Blue is the color of monarchy, white is Buddhism and red is the people. 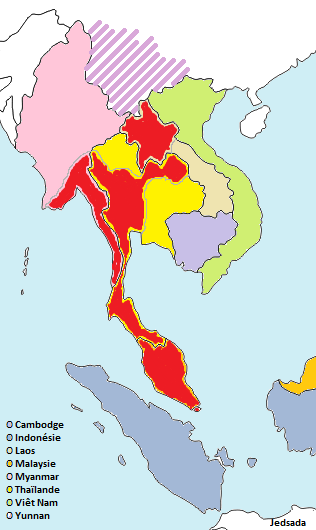 In the course of its history, present-day Thailand has often changed its name and boundaries according to the different kingdoms that, over the centuries, have formed there. Between the 1st and 13th century AD, the Kingdom of Suvarnaphumi (Golden Peninsula) extended over the area of present-day Thailand. The numerous sources of fresh water, the abundant edible vegetation and the richness of the ores found there gave its name to this peninsula. The various coins found in the region reveal the prosperity of the kingdoms of Funan, Dvadaravati, Srivijaya and Lawo. Until the 6th century, Funan, originally spreading over the plains of the Chao Phraya River (south of Bangkok) expanded to the Mekong River Basin to cover the south-east of present-day Thailand. Its geographical location and ease of access contributed to its success and the kingdom became the main trading center of Southeast Asia. The region's boom attracted merchants from all over and mainly from India and China. People migrating to Funan brought with them their currencies. Thus it was found there also gold Antonius dated 152. The coins in circulation were silver coins. They were cast and their design was inspired by the pieces brought by merchants from India. Around the 6th century, the popularity of the Kingdom of Funan declined. A dozen kingdoms declared their independence. Between the 6th and the 11th century, the Kingdom of Dvadaravati dominated the region. Dvadaravati means "City with multiple doors". Its geographical location allowed it to welcome businessmen from the land and the sea; which contributed to the development of the commerce and wealth of the kingdom. 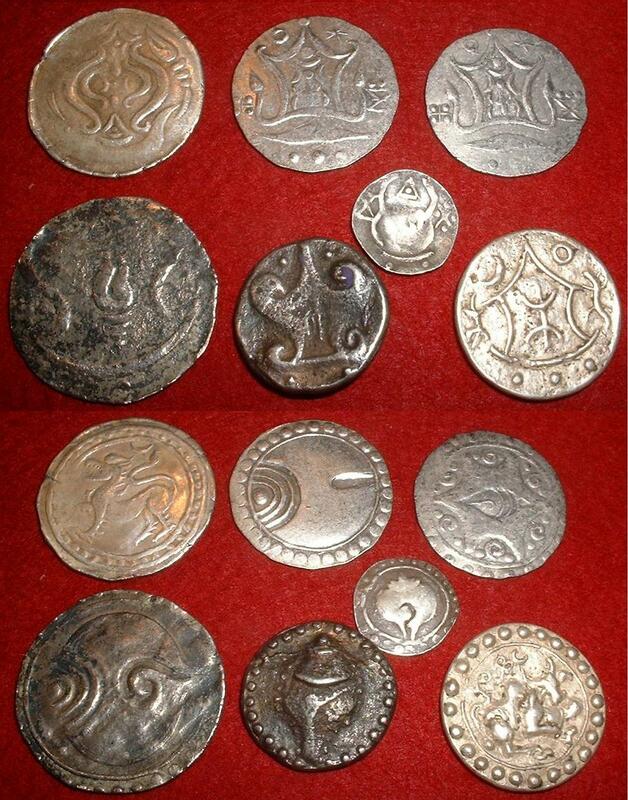 The Kingdom of Dvadaravati produced several kinds of coins which served as bargaining chips. Their design reveals the power of the kingdom through monarchical symbols and religious symbols (Buddhist and Brahmin). Some pieces represented a cow, a goat, a hare or a lily leaf with fish eggs on the listel and a shrivatsa on the reverse. Following the expansion of the Kingdom of Lawo and the invasion of Khmer, the Kingdom of Dvadaravati lost power in the 11th century. For 8 centuries, the Kingdom of Srivijaya or the "Land of Merchants from the Sea" was enriched by controlling the trade between the different communities of the South of the Golden Peninsula as well as trading by sea route between China and India. The 2 main currencies were Dok Chan and Namo. The Dok Chan, in gold or silver, is a round, flat coin with a 4-petal flower on the obverse and the word "Wara" in Sanskrit on the reverse. Namo, smaller, was made of silver alloy and antimony. The obverse was struck with a letter resembling the Thai N (น) while the reverse was raw. In 1275, the Kingdom of Srivijaya disintegrated following the attack of the Javanese and lost what was its strength: the control of the ports. While, between the 5th and 13th century, the different kingdoms rivaled power, it was necessary to count also with the Kingdom of Lawo. Lawo comes from "Lawa", the name of Phra Rama's son who is a figure of Thai mythology. The territories of the Kingdom of Lawo were under the control of the Kingdom of Dvadaravati during the 8th century and under the control of the Kingdom of Chen-La between the 9th and 11th centuries. In 1283 it was annexed by the Kingdom of Sukhothai. 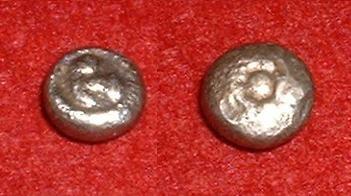 Small silver coins circulated in the Kingdom of Lawo. They were called "Lawa Bura" because of the Sanskrit inscription "Lawa" on one side and "Bura" (city) on the other. During the 13th century, many kingdoms liberated themselves from the Khmer and developed their administrative and economic independence. The kingdom of supreme greatness was the Kingdom of Sukhothai on which is based the current Thai culture and especially the Thai alphabet. 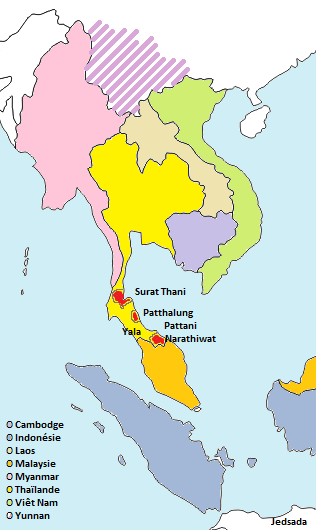 The Kingdom of Sukhothai developed close commercial ties with neighboring kingdoms: the kingdoms of Lan Na and Lan Chang. The Kingdom of Sukhothai was founded in 1238 after the union of the armies of different kingdoms of the Golden Peninsula who took over the administrative power from the Khmer and declared the independence of the kingdom. The summit of the administrative, political and developmental power of the kingdom was reached during the reign of King Ramkhamhaeng, from 1279 to 1299. 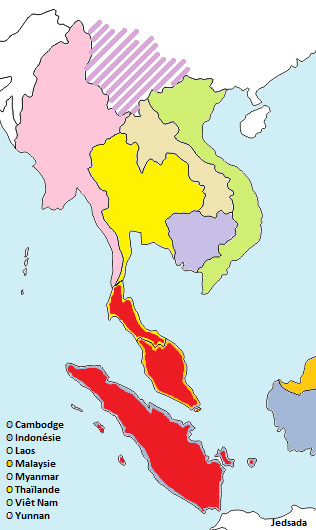 The territory of the kingdom extended over the entire Malay Peninsula. The popular currency was the "Pod Duang". The origin of the word would be derived from the word kod duang which means "wound insect larvae". It was a silver bar, pointed at its extremities which, struck with a hammer, took the form of a larva. The rulers of the Kingdom of Sukhothai did not monopolize or limit the production of Pod Duangs. So we found different styles and specifications. The punches found there could thus be the leader, the producer or the authority guarantor of the purity of the money. From one to seven punches determined its origin and cuts guaranteed the mass of money. After 200 years of power, prosperous commerce and cultural dominance, the decline of the kingdom began. 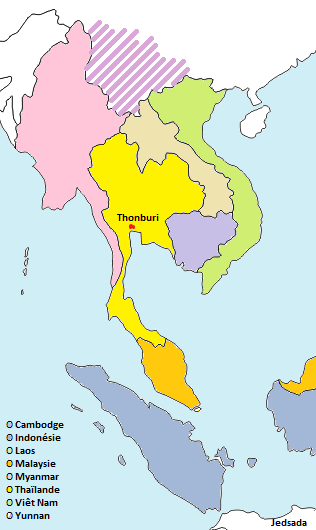 Around 1438, Sukhothai became a satellite state of the Kingdom of Ayutthaya. Chiang Mai, capital of the Kingdom of Lan Na was founded in 1296. 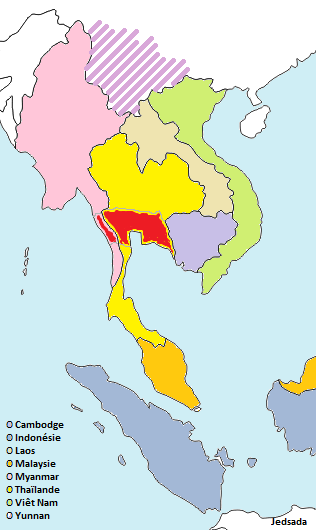 The period of full development of the Kingdom of Lan Na coincides with that of the kingdoms of Sukhothai and Lan Chang. Therefore, in order to create a climate of peace and ensure the tranquility of their kingdom and to compete with the power of the Burmese, Sukhothai and Ayutthaya, the king of Lan Na favored political and economic relations with the kingdoms of Sukhothai and Lan Chang. This allowed for a long period of socio-cultural exchanges and very good commercial relations. These merchants brought with them silver and gold coins of all shapes but of precise sizes and weights called "Sycee". They had Chinese inscriptions according to their region of origin. The local currency was different and had names such as "Chiang (Kha Keem)" (pincer), "Bai Mai" (leaf), "Dok Mai" (flower), "Tok (Hoi Koang)" (shell) or "Pak Moo" (pork mouth). These different currencies were made of silver or silver alloy. Bronze coins were also circulating to "count". The currencies used in the Kingdom of Lan Na and mainly the "Tok" remained in use until the reign of King Rama V.
The territory of the Kingdom of Lan Chang extends along the east coast of Mekong River, between Lan Na and Annam (the current Vietnam). 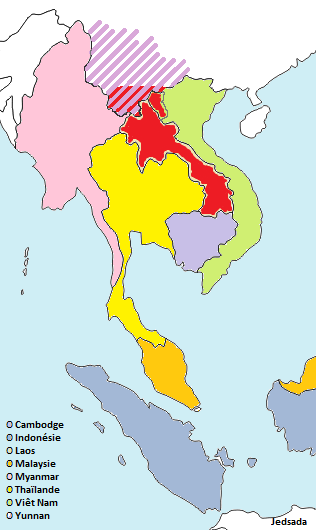 During its period of prosperity, it even extended north as far as Xishuangbanna in Yunnan and as far south as Cambodia. Good relations with adjacent kingdoms have diversified the type of currency in Lan Chang. Thus, each community could produce its own currency according to its own standards. Currencies from more distant lands, such as Pod Duang from Sukhothai, E-Pae from China, Rupees Burmese, the Ring, Ding and Bar of Annam and the Chang of Lan Na, were accepted. The Kingdom of Lan Chang also produced its own currencies: the "Hang" (trough) which was in pure silver at over 980 ‰, the "Tu (Hang Noi)" (silver bar with rounded edges), the "Hoi" (weight measurement unit equivalent to 10 Baht) and the "Lad (Tong Lad)". While the "Hoi" is silver, the "Lad", of the same appearance is smaller and is made of copper and bronze alloy. The "Hoi" was marked "ห ม" (for Chiang Mai) or "กก" (for Chiang Rai) at each end and at center while the punches on the "Lad" were elephants, turtles, fish, asterisks, chakras etc. The Lad (of Talad, market) was the small currency used for current purchases. 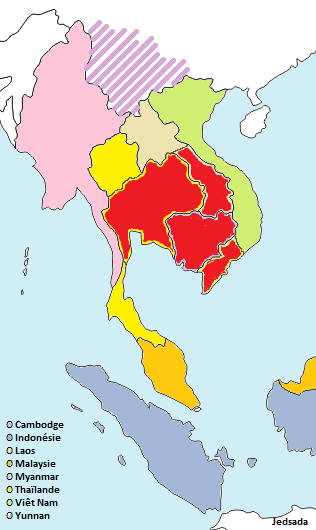 In the 13th century, many small territories contributed to the rise of the kingdoms of Sukhothai, Lan Na and Lan Chang. Of these, there are 5 whose prosperity extended beyond the 15th century: Pattani, Yala, Narathiwat, Phatthalung and Surat Thani. These territories were strongly influenced by China and the Arab countries. Trade with the Arabs and Chinese has brought a great diversity of circulating currencies. There were gold coins with Arabic signs as well as E-Pae Chinese. The latter were even cast locally lead alloy and tin to meet the need for small change. They had inscriptions in Thai, Chinese or Arabic. Each state that produced the E-Pae affixed its own signs. They were used for many years before being replaced by small local currencies. For 417 years, the Kingdom of Ayutthaya lived in greatness. Its territory extended from the junction of important rivers, which favored the irrigation of the agricultural lands, to the sea, which favored the international trade. 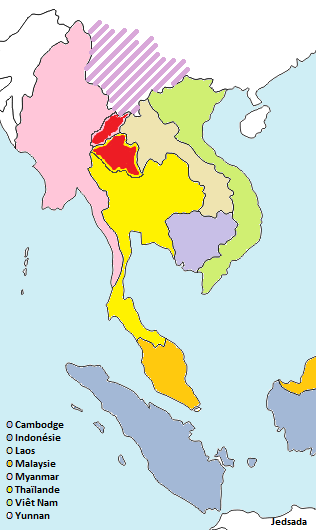 In addition to an ideal geographical location, a structured political system, an organized economy and an orderly society that contributed to its power, Ayutthaya produced the currency that fed its own monetary system. .
Ayutthaya developed its port cities on the Gulf of Thailand and allowed trade with Peninsular Malaysia, China, India, Arabia, Japan and Europe. The Royal Court sent boats to the four corners of the earth, which also contributed to the prosperity of the kingdom. The Portuguese were the first to trade with Ayutthaya. The Spaniards, the Dutch, the English and the French were attracted, too, by skins, aromatic woods, pepper, spices, tin, rice, ivory and other riches that could be found on the stairs. Trade being important for the economy, the state decided to control them and imposed a single monetary system. He reserved for himself the monopoly of production. As in the flourishing period of the Kingdom of Sukhothai, Pod Duang was the base currency in Ayutthaya. However, it undergoes some modifications and was constantly evolving. Thus, over time, Pod Duang of Ayutthaya became more compact and its spikes wider. the mark of the king. The Pod Duang being mainly a currency circulating between merchants, the people used the "Bia" for their purchases. These shells, brought by the merchants coming from Maladives, from India or the Philippines had a value of 1/800th to 1/600th of Fuang depending on what merchants could bring back. In 1744, the Bia coming to run out, another small coin made its appearance: Prakub. This terracotta coin had only one marked face, the other being smooth. The marks that could be found there were the lotus, the hare, the lion, the hen as well as other signs referring to Buddhism. As many merchants came to trade, the Kingdom of Ayutthaya was flooded with many foreign currencies. Thus, Japanese O-bang and Ko-bang, British Pounds, Spanish Reales and others were also found. The leaders therefore introduced a system of exchange between the Thai silver currency and the various foreign money currencies. Thus, 1 Chang was equivalent to 48.75 Real Spaniards. Under the onslaught of the Burmese, the Kingdom of Ayutthaya fell, but the Pod Duang survived. The new king Taksin managed to repel the Burmese of a large part of the kingdom. But when he returned from the war, he could only see the destruction of the Kingdom of Ayutthaya. On December 20, 1767, he made Thonburi the new capital of the kingdom. The city was small in area, so easy to manage and defend, and by the sea, so conducive to trade. He sent emissaries to China to revive exchanges and hire labor. At the beginning of the reign, Pod Duang of Ayutthaya was still the currency of exchange. Later, King Taksin produced his own Pod Duang with the same characteristics but adorned with his royal sign: a Trisula (trident) or, according to other sources: a Thavivudh. During the reign of the Chakri dynasty, Pod Duang remained the base currency. The different sovereigns struck their marks. In 1782, after the assassination of King Taksin, the nobility and the servants of the people chose Chao Phraya Chakri, general of the Siamese army, to make them their king. In 1785 he made Bangkok the capital. That same year, in addition to the Chakra, mark of the kingdom, he had his emblem, Bua Unalom applied to Pod Duang. Peace had returned and with it, economic growth picked up again. Thanks to trade with China, Singapore, Penang and Saigon, the state coffers filled up again. The currency remained Pod Duang with, as a royal sign, the Garuda. The values were: Baht, 1/2 Baht, Salung and Fuang. The reign of King Rama III was marked by a political and administrative security where religion was dominant and the economy flourished. On June 20, 1826, Siam and the United Kingdom signed the Treaty of Burney thus abolishing the state monopoly that had been established at the time of Ayutthaya. This agreement intensified trade with many countries. China remained, however, the first partner. The currency produced during this golden period remained Pod Duang. 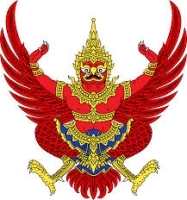 Garuda was replaced by Prasat (Royal Palace). The values were: Tamlung, 1/2 Tamlung, Baht, 1/2 Baht, Salung, Fuang, 1/2 Fuang and Pai. These last 2 being too small for 2 punches, only the Prasat was hit. - the Pod Duang Krut Sio in silver worth 10 Salung. They were distributed to the Royal Family and the ancient servants of the people in memory of the cremation of King Rama II on April 29, 1825. - the Pod Duang Bai Matum in gold and silver in memory of the cremation of the Princess Mother, May 6, 1836. It was produced in 6 different values: the Baht, the 1/2 Baht, Salung, Fuang, 1/2 Fuang and Pai. - the Pod Duang Chaleo in silver of the value of 1 Baht. The particularity of this Pod Duang is that it had only the mark of Chaleo. Chaleo is a magic sign that is supposed to protect against diseases. - the Pod Duang Prasat in gold to celebrate the Wat Phra Chettuphon (Temple to the Reclining Buddha). On this occasion, the king had also produced Pod Duang Dok Mai (flower) of gold and silver. Rama III was very religious, which brought a big change in the currency of Siam. The Bia being a shell, therefore a living creature, his use as a means of payment was, in his eyes, a great sin. He therefore forbade its use and tried to produce copper pieces. It marked a great turning point in the history of the Thai currency: the production of flat pieces for circulation. 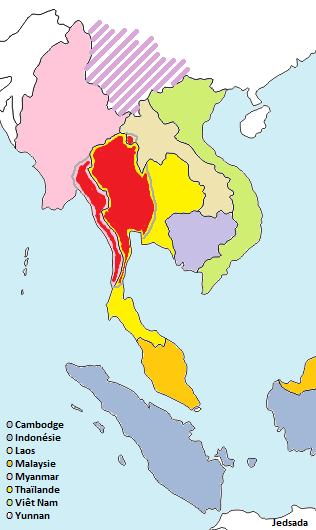 During the reign of Rama IV, Siam worked to safeguard and modernize its sovereignty in the face of the expansion of Western colonization. Thanks to his wisdom and his diplomatic genius, King Rama IV establishes friendly relations and free trade with the superpowers. In addition to maintaining independence and national sovereignty, these relations also contributed to economic development and the modernization of monetary production. The most important change is the changeover to money produced by machines. The flat pieces replaced the Pod Duang. For the first time in its history, Siam entered the international system. At the beginning of the reign of Rama IV, Pod Duang was still in circulation for the domestic trade. In 1851, he produced Pod Duang gold struck with Chakra and Mongkut (crown), its symbol. The values ​​were: Tamlung, 1/2 Tamlung, Baht, 1/2 Baht , Salung, Fuang, 1/2 Fuang and Pai. Later, he produced other Pod Duang in silver and gold. Faced with the inability to produce enough of Pod Duang to satisfy the demand and to prevent the proliferation of counterfeits, King Rama IV printed paper tickets, the May. Following the Treaty of Bowring, signed on June 18, 1855, and later, to the same agreements with the United States, France, Portugal, the Netherlands, Prussia and Other Western powers, many changes were introduced in the economic system including the limitation of import-export taxes and the repeal of the monopoly of taxation by Siam. These free trade agreements between foreign merchants and Thai merchants meant that trade intensified and money was no longer sufficient. On May 8, 1857, the King ordered a steam engine to produce coins to be put into circulation in September 1860. In the meantime, a manual machine, offered by Queen Victoria, was put into service and produced what the Thais called " gift coins. The silver and gold coins were Baht, 1/2 Baht, Salung, Fuang and the 1/2 Fuang. Smaller coins were also minted. 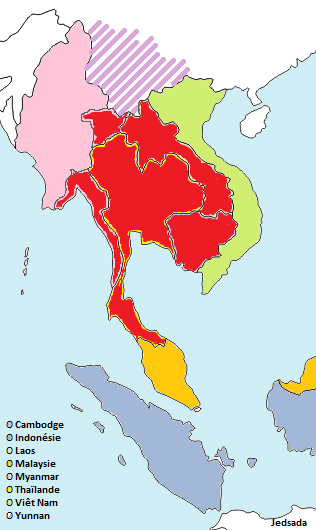 The reign of Rama V was marked by great reforms. In 1876 a new machine, electric and faster than the previous one, started the production of parts. It is on this machine that for the first time coins were coined where a Siam monarch was represented. In 1904, Pod Duang, in place since Sukhothai period, was permanently removed from circulation. In order to adapt to Western norms, the monetary system that previously had 13 levels based on the weight of noble metal (see table below) was changed to the decimal system where 1 Baht was worth 100 satang. Pieces of 5 and 10 Satangs in nickel as well as 1 Satang were ordered in Belgium and 1 Baht coins in silver at Paris. These were delivered after the death of the King. His successor, Rama VI had commemorative plaques made, which were distributed at the cremation of his father. During the first three years of his reign he changed nothing about the production, design and value of coins. In 1915, the small money coming missing, he had coins of 1 and 2 Salungs (1 Salung = 25 Satangs) containing 80 % of money. Because of the war, the price of metals increased considerably with the result that the money rate in the currency went down to 50%. During his rise to the throne, King Rama VII faces a catastrophic budget balance. It is therefore taking steps to reduce expenses including stopping the production of coins. As tradition dictated that each king had his "coins" coined, he ordered silver coins abroad for his portrait. The facial values were 25 and 50 Satangs. Thus, it put an end to the transition between the system based on the silver weight and the decimal system. Transition that had still lasted ten years. In 1932, a coup abolished absolute monarchy in favor of a constitutional monarchy. The institution managing the finances as well as the minting of the coins changed its name and from "Ministry of the Royal Treasury" became "Ministry of Finance". Following the abdication and exile of Rama VII, the parliament invited his eldest son, then 9 years old, to ascend the throne. He became King Rama VIII. The first coins minted under his reign were worth 1, 5 and 10 Satangs. Their design was identical to the previous pieces. It was in 1939, when "Siam" changed its name to "Thailand", that the inscription "สยามรัฐ" (Government of Siam) disappeared from the rooms and was replaced by "รัฐบาล ไทย" (Thai Government). After the tragic death of his brother on June 9, 1946, young Prince Bhumibol Adulyadej was invited to take the throne. Thailand had its 9th king of the Chakri Dynasty: King Rama IX. He brought prosperity back to the Kingdom. He completed the integration of Baht into the international monetary system and adapted the coins to international standards. In 1950, the first series of coins struck during his reign included pieces of 5, 10, 25 and 50 Satangs. Due to its low face value and high cost of production, the coin of 1 Satang was dropped. The first coin of 1 Baht in his likeness was struck in 1957. Since then, the design of the pieces has often changed. Many commemorative coins struck each year are very popular with the public. Current currency is Baht (THB). A Baht is equal to 100 Satangs. The various coins used in Thailand are: 25 Satang (also called 1 Salung), 50 Satang, 1 Baht, 2 Baht, 5 Baht and 10 Baht. Every year commemorative coins over 1 Baht are minted but not intended for circulation. Garuda is a fabulous bird-man of Hindu and Buddhist mythology. He is the emblem of the monarchy in Thailand; a yellow flag with a red Garuda (called Khrouth ครุฑ, in Thai) floats on the palace when the king is present. It is also considered a national emblem, as it adorns the official buildings, the passport and the banknotes. In recognition of the services rendered to the nation, the king grants some large commercial companies the right to use it to decorate their facade and their official documents.